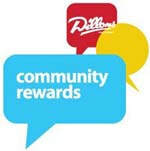 Support All Saints with the Dillons Community Rewards Program. ​Link Your Dillon's Plus Card to earn money for All Saints Catholic Church. ​How do I link my Dillons Plus Card to All Saints Catholic Church? Link your Dillons Plus Card to All Saints Catholic Church by either scrolling through the list of participating non-profit organizations OR enter the Non-Profit Organization (NPO) # for All Saints Catholic Church - NPO# 10010.